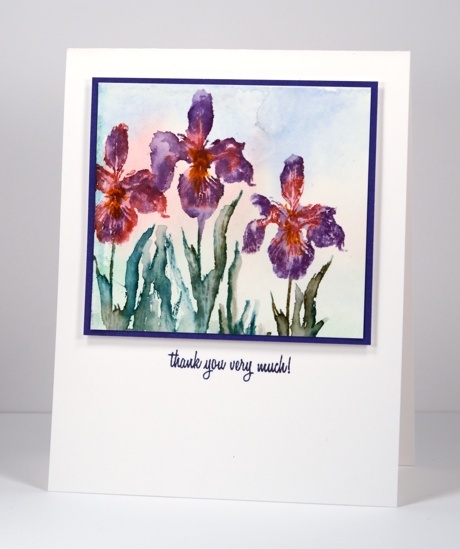 These little irises are a bit of a contrast to the large floral brushstroke stamps Penny Black released a few months ago. The iris is from a transparent set called Allegro and is one of six flowers in the set. I used a selection of distress and memento markers to ink the stamp and watercolour paints to create a soft wash in the background. I spritzed the stamp before stamping and also used a brush to blend colours on paper once stamped. I think I prefer working on a slightly larger scale but it was an interesting exercise to see how much detail I could get on such a little watercoloured scene. There are brand new stamps and dies on the PB blog this week with give-aways! I hope to feature them here on Bits & Pieces very soon. Love how you captured the colours of classic bearded irises. A favourite spring flower of mine. Beautiful irises, Heather! They’ll be blooming here soon. Heather, beautiful work as always. I so enjoy your beautiful colors.